Award Winning 3 Bedroom Penthouse. Retro chic in a truly breathtaking setting. *EXACTLY ADJACENT TO THE BEST SECTION OF IPANEMA BEACH,POSTO 9! JUST 5 MINS WALK!! * SAFE ,SECURE, CENTRAL .IN THE SWISHEST PART OF IPANEMA! * LUXURY BEDDING (ETHICALLY SOURCED HUNGARIAN GOOSE DOWN DUVETS/PILLOWS,DESIGNER HI-THREAD SHEETS ETC ETC) . Bossa Nova! As electrifying, colorful and dynamic as the pulse of this exciting city, this penthouse is a dynamic fusion of contrasting textures and details. With such a bold design ethos this unique duplex is perhaps the most beautiful penthouse in Ipanema. Many celebrated (and not so famous!) guests have loved relaxing amid the chic ,retro and slightly quirky ambience on offer here.I also have welcomed many esteemed architects and designers,for example,who have truly appreciated what sets this project apart from the rest of the market. Located in the heart of Ipanema’s very best neighborhood, relax in your own exclusive hideaway perched high above the trees and the action.Situated along a peaceful leafy residential street, this mid-century style penthouse occupies the top two levels of a modern and architecturally distinguished building. Thrill to the iconic and panoramic views of mountains,the Christ statue and the city below. Highly recommended and featured in 'Boutique Homes','The Sunday Times' magazine(UK) , 'Savoteur' and 'Living Etc' (the biggest selling modern homes magazine in the UK). Twice winner of the Best Private Rental in Rio in the LUX Awards. The double height layout means there are areas to share and areas for privacy. The main living and dining spaces feature a balcony overlooking the treeline and streets below along with the fully equipped kitchen and both a double bedroom,shower room and a smaller en-suite single bedroom. The upper floor features the large en-suite master bedroom and dressing area along with a private sitting room off of the main terrace.Great to have your own private domain, apart from other guests below on the first floor. Equipped with a heated Jacuzzi,designer recliner and dining table for four, this is the spot for stunning views of the famous Mt. .Corcovado’s Christ the Redeemer. The interiors are a fun and colorful mix of elements and period design creating a distinctively Brazilian character. The apartment is even located in the same street as former resident ,the legendary “The Girl from Ipanema” composer Antonio Carlos Jobim.Just some of the many artists represented include Aoleo,Oscar Niemeyer,Carlos Sena,Chico Fernandes and Andy Warhol.Furnishings includes work by world renown designers Eileen Gray, Florence Broadhurst,Sergio Rodrigues,Vivienne Westwood and Giuseppe Scapinelli. Situated in a calm tree lined residential street referred to by locals as the “noble” area of Ipanema, you are ideally placed just adjacent to Rua Vinicius de Morais in the safest part of the city. Just four blocks from the beach and a couple of blocks from the Lagoa and the main thoroughfare, this is the very best area within Ipanema. You will love the convenience of being directly parallel and just 350 meters (5 minute walk) to Post 9 on the beach,generally regarded as the absolute apex of Carioca beach culture. The pulsing beat and joie de vivre of overlapping cultures is the charm of Rio, from the vibrant Copacabana on the south side and the twisting density of the favelas, to the dizzying action of downtown and the fashionable coastal beaches,the vibrant rhythms and diversity of the city are captivating. Surrounded by tropical rainforest with the iconic Sugarloaf monolith and Mt. Corcovado’s Christ the Redeemer overlooking the city, this world famous town is everything and more. Extra Maid Service: Extra maid service is available.A day session(4/5 hours) costs R170.A mini session lasting approx. 2 hours is available for R110.Please make sure you book these,if required, at the time of booking as they can be difficult to arrange last minute.Their duties can also cover ironing,food shopping and child minding.An English speaking babysitter of 20 years experience dealing with 3 months to 8 years is available for R50 per hour,plus taxi fare if required to stay after midnight. Airport pick up service. : we are happy to provide you with a very reliable named driver in a new model, air conditioned saloon car for R140 .He will wait for you at arrivals with a placard bearing your name. I strongly recommend you take advantage of this offer as it helps my management to co-ordinate your smooth arrival at the apartment.It also assures you of a stress free arrival! Payment is direct to the driver.A van with an 8 seat capacity plus luggage is also possible for R220.Great rates are also available for local car tours or trips further afield to Parity or Buzios,just ask! Sleeps 5 in conventional beds.There is a sofa bench/bed in the 2nd living area that can be utilized as a single bed and 2 spare single futon mattresses that can be placed anywhere.If you are willing to be flexible in your sleeping arrangements up to 6 individuals can be comfortably accommodated.I can also provide a cot for babies. The building has 24hr front of house doorman security,all public areas are subject to surveillance cameras and the building is fully gated.You have a personal electronic safe in the master bedroom. IMPORTANT NOTE: This is a residential family building, not an apartment hotel.This is strictly NOT the environment for sexual tourism.Inviting people you don't know on to the premises can place your fellow guests at risk and compromise the safety and security of other residents.Thank you for your understanding. Finally this unique property is suffused with the natural scenic grandeur of Rio.Being a penthouse also means the apt. is flooded with light (many Rio apts. can be dark due to so many tall buildings facing each other). If you wish to make a booking please forward flight details if applicable,projected arrival and departure times and the names of all guests.The person making the booking needs to send photo id(passport/drivers licence).This is required by the building management. Upon booking you will be sent very detailed info on the best of local attractions and a practical guide to the penthouse itself. Very widely traveled.Brought up in the Far East and Australia,am now mostly based in the UK. My design work has been featured on magazine covers world-wide. My penthouse in Rio's beach haven of Ipanema is my personal favourite! I am,together with my staff, 100% committed to providing you with the best travel experience possible. Ipanema is almost like a small kingdom set apart.The timeless life style associated with such easy access to such an extraordinary beach is very seductive.Quite simply Ipanema is in a class of it's own.It's where Brazil looks for new trends and is a show place for the nation.It is classic,eternal Rio and the energy is palpable.It is the Rio of your dreams! Rio (a city that,even within Brazil, is the most 'Brazilian' of cities) is also a very culturally rich society with a strong theater tradition,great modern artists,the center of the telenovela and media industries,an extraordinary and diverse musical heritage and a vigorous intellectual history involving great writers and architects. Space, and a tremendous feeling of privacy floating above Ipanema in your own private world. Apart from great style,I think to have the rare combination of 2 entirely different outdoor spaces on separate floors together with contrasting and amazing views, coupled with the location so close to Posto 9 on the beach.All this and being a penthouse awash with natural light allows for an ambiance that is truly special!! View more about Alastair G.
3 shower rooms in total, and outside Jacuzzi. Exactly parallel to Post 9 on Ipanema beach. Visible from the condo is the statue of Jesus which stands 38 meters tall, atop the Corcovado mountain overlooking Rio. It has become a symbol of the city and of the warmth of the Brazilian people. A mere 5 minute walk away to the best part of Ipanema beach. There is a local mobile phone available if required.Please note virtually all Brazilians use Whatsapp. All 3 bedrooms and the living/dining area have remote controlled split air con units. There are wall /floor fan options available throughout the entire penthouse.Do not run AC when windows are open! Bed sheets range from high thread Egyptian cotton,French linen to my favorite silky Bamboo. Large capacity American sized washer. Separate American style dryer.Please clean filter after every use! There is also a ceiling and floor hanger. There are 2 spaces in the building basement designated specifically for the penthouse.Just choose an available space. Also great if you have someone visiting you by car. Part of the internal building.Gated,under 24 hour doorman supervision. Reliable and fast.On both floors. Please note that locals would never take a towel to the beach. They are seen as bringing sand into the home. They use cotton wraps(easily available on the beach for around BR R35). Due to location and being a penthouse the signal is very strong (not always a given in Rio). There are 2 lifts. One is social and the other is the service elevator. There are 2 living rooms.The main living space is on the 1st floor.In addition there is a relaxation lounge on the 2nd floor overlooking the upstairs terrace with breathtaking views. Danish 70s designer cafetiere. Nespresso machine on request. US imported. Also electric panini(sandwich grill). Staples include salt, pepper, selected spices should be available but are not guaranteed. Service for 6 . Various pots, pans and utensils are available for those who like to cook. Hot plates, place mats, etc. are provided. Refurbished with all new "push and release" cabinets.Improvements include new glass splash back,copper ceiling fan and bronze wall panels!Recommend bottled water.No garbage disposal.Granite worktop. There are 2 Smart Flat screen TVs with remote controls. Cable TV provided with US channels. Remote can change audio to English and add subtitles. Google Chromecast has been fitted to living room tv.If you have an account you can access Netflix,BBC etc. in the living room and master bedroom. There are a selection of books in English,including a good selection of local guide books. there is a wide selection of DVDs,including current releases.There are no video games. Located on the 1st floor off the main living area with covered seating.View overlooks Ipanema and Christ statue. large terrace with outdoor Jacuzzi,a parasol, designer chaise lounge,table/chairs and outdoor sink.Incredible views of Christ and the mountains. no problem to gain access to first floor where one can be entirely self contained,but clearly the spiral staircase means access to the 2nd floor is prohibitive. Outdoor private hot tub with separate hot and cold water taps and air jets. Not overlooked. No one under the age of 16 is allowed to operate the Jacuzzi. Due to the 2 outdoor areas being so high up I would suggest particular care needs to be taken with children between 2 - 5 years.There is a stair gate/playpen for use around the base of the spiral staircase.A crib can also be made available. There are also 2 extra single futon mattresses that can also be utilized if required. Elderly/infirm OK if they stay on the first floor. For wheelchair users access is fine from the street through the elevator to the main first floor.Access to the top floor restricted due to the spiral staircase. There are 2 free car parking spaces in the building,useful if you rent a car or have Brazilian friends visiting. The building has 24 hour security staff at reception. Super cosy and nice decorated apartment in top location from a very nice host. Had a great time and would love to come again ! It comes with a parking in the garage . The location is in the center of Ipanema with everything what u need. It made my time in Ipanema more than perfect. I leave a part of my heart here in Brazil. Book it! I'm surprised no one else has said this in their reviews so I'm going to lead with it. This place is amazing but it is very noisy. We absolutely loved our stay and everything about the place is absolutely wonderful, but it is right next door to a very loud elementary school so from early morning to mid afternoon there is constant kid screaming, laughing, playing. If you're out and about doing the tourist thing from the early morning onward this won't be a problem. If you're taking in some of Rio's excellent night life and plan to sleep in, that could be a problem. If you're planning on sticking around the apartment during the day like we did while we were preparing some work, the noise can be absolutely mind numbing. This is no fault of the owner and in fact there are white noise generators in every room in the house. The balcony is wonderful, amazing views. The place has all the amenities you would need. The internet and wifi worked great. We really enjoyed our stay with the exception of the noise. I'm sorry your stay coincided with the annual 'Festival Do Esporte'. Carnival is another time best avoided if you wish to have a quiet break.The streets can be jammed with noisy revellers. Most guests rate this central,close to the beach location 10/10. Appreciate your message on leaving that you and Veronica “really enjoyed our stay in your lovely space!”. Great location, beautiful and spacious apartment. Manager and owner always on top of everything! Would stay again with great anticipation!!!!! It was a pleasure to host you and your fellow professors for the fortnight you spent in Rio working on your book project.Delighted your stay was both fun and productive! Had a fantastic stay! Alastair's very stylish place truly captures the colour and vibrancy of Rio! On a quiet tree lined street but steps away to the beach and all the action. 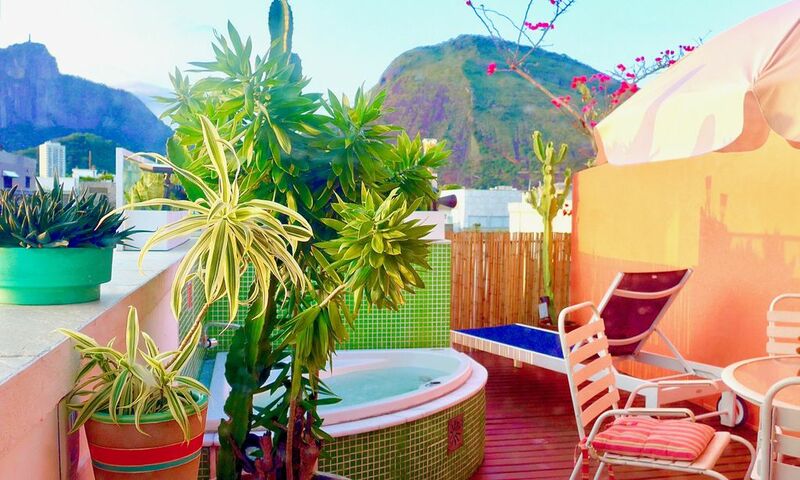 The rooftop deck is perfect for a Jacuzzi and chill after a day at Ipanema beach. Ellie (the host that met me) was super helpful in finding a reasonably priced gym close by (Beach Club Gym) And the doormen at the building were all so kind and helpful as well! I stayed here with 2 friends during Carnival. The split level structure allows for both communal dinners/drinks etc but then privacy when required. The host was very responsive and friendly and an invaluable source of information about the neighborhood and Rio in general. I would recommend this without reservation as a pace to stay if you want to have a great Rio experience. Positioned in a calm,residential street canopied with tropical trees adorned with orchids, this is referred to by locals as the 'noble' area of Ipanema. Being to the left of Rua Vinicius de Morais this is seen to be the safest and the most desirable prime area within Ipanema, not being in the 'shadow' of any favela.Known as the 'Beverly Hills of Rio' due to the many telenovela stars who live here. Tom Jobim wrote the classic 'The Girl From Ipanema' song while living in this street in 1962(a plaque commemorates this at no.107). You are exactly parallel to and just 4 blocks from the legendary Post 9 on the beach. 2 blocks from the exciting shopping opportunities on the main thoroughfare of Rua Visc. de Piraja, and just 3 blocks from the Lagoa. Although taxis are plentiful and inexpensive, being so well located means you can walk to all the local culinary,cultural and nightlife attractions Ipanema is so famous for.You are assigned 2 parking spaces within the building which is useful if you hire a car or have Brazilian friends visiting. A departure cleaning/laundry fee of GBP£60 will be added. You will be asked for a security deposit of GBP£500, against any possible damages. Will be returned to you within 7 days of your departure once the apt has been oked by my manager. STANDARD RATE from £168 a night. PEAK SEASON 15 December-15 April from GBP£190 per night After the 2nd guest there is a fee of £20 each additional guest. Generally there is a 3 night minimum, but exceptions can sometimes be made. Please do ask. We do try to be flexible with arrivals and departures. If you wish to secure a guaranteed early arrival or late departure there is a fee of half the daily rate. Carnival and New Year subject to 10 night min @ all inclusive price of GBP£3900.